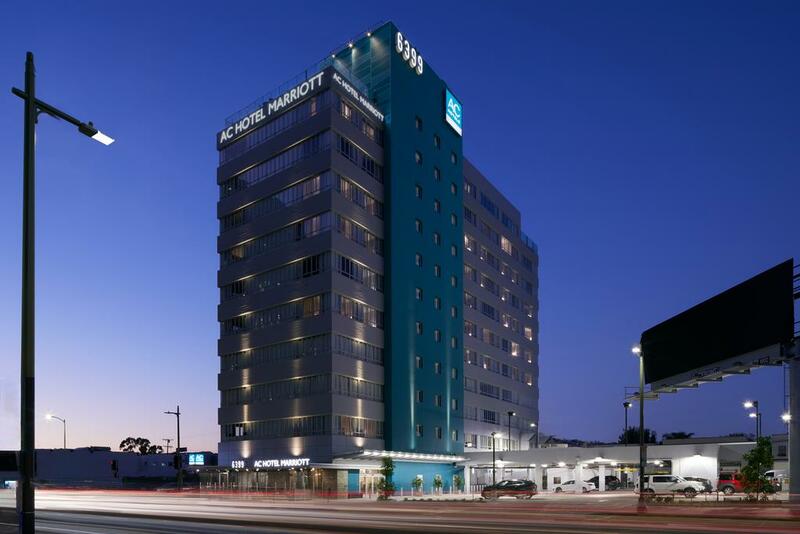 In a neighborhood known for stylish imports, the AC Hotel Beverly Hills, the first Los Angeles-based locale for the design-led European lifestyle hotel brand, AC Hotels by Marriott® opens. Developed by Reliable Properties and Seaview Investors, and managed by Interstate Hotels & Resorts, the 142-room property located at 6399 Wilshire Blvd places guests close to famed cultural and retail draws such as Rodeo Drive, The Grove, Los Angeles County Museum of Art (LACMA), Petersen Automotive Museum and the Beverly Center. The original Art Deco façade of AC Hotel Beverly Hills embeds the new 11-story hotel in Wilshire Boulevard’s historic architectural legacy. Once inside, the ambiance transitions to AC Hotel’s curated blend of European soul and Spanish roots, born from the signature vision of renowned hotelier Antonio Catalan who created the AC brand in Spain circa 1998. Guided by his founding philosophy of purposeful design, hospitality design specialists Design Force Co. paired AC Hotels’ natural elegance with rich colors and geometric shapes inspired by the style of Beverly Hills. AC Hotels by Marriott was created with the belief that each aspect of the hotel experience should have a thoughtful response to “why?” AC Hotels edits away the unnecessary to remove friction, allowing guests to focus on what’s important to them. Within the 1-king, 2-queen, and 1-bedroom suites, the friction of travel is alleviated by AC’s intuitive furnishings, open-closet system, and a modern touch ingrained in simple, clean lines. Vast windows direct natural sunlight to hardwood floors opposite vaulted ceilings. On the 11th floor social rooftop, an outdoor wading pool stretches north to a second terrace, providing dueling panoramic views of Los Angeles. In between lies the Terrace Bar and its custom, full-height ‘Party Wave’ mural by wayfaring artist Allison Kunath. Down on the lobby level, AC Hotel Beverly Hills features the brand’s signature open-concept spaces outfitted with carefully selected décor, modern artifacts and art installations curated by NINE dot Arts. Guests and locals will be drawn to the island bar of the AC Lounge for tapas and complimentary WiFi. Adjacent is the AC Library, a stylish refuge for a read or retreat. The AC Kitchen is open daily for breakfast, offering sweet and savory tarts, freshly baked croissants and a selection of artisan cured meats and cheeses. Both the fitness facility and the AC Store are open 24 hours. Amenities take a 21st century spin with AC the Robot. AC can be encountered in elevators and seen gliding through hallways on the way to its next delivery. Guests in need of an item can summon AC, who appears in good time with the cargo in request. Refreshments, shampoo, fresh towels, snacks, backup wine opener – it's all on the menu. When guests are ready to venture out, a myriad of celebrated attractions await in all directions: Rodeo Drive to the west, The Grove entertainment destination and the Original Farmers Market to the north, LACMA to the east, and Beverly Hills and Hollywood’s acclaimed dining and nightlife all around. Perfectly situated, AC Hotel Beverly Hills is just minutes from Downtown Los Angeles or the beaches of Santa Monica and Venice, making this first new entry into Los Angeles the perfect location for business, leisure or a nearby staycation.